1825 Inn Bed and Breakfast in Hershey PA. 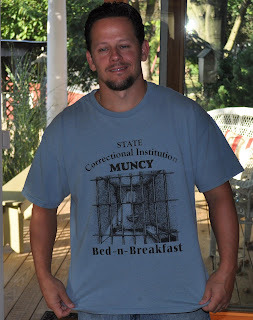 Rob came to breakfast in his Bed and Breakfast Tee Shirt, Rob works at the State Correctional Institution in Muncy. Everyone got a big kick out of the tee shirt. Later that evening they got a night out from the Kids and went to Alfred Victorian Restaurant in Middletown.